Summer of Socks motivation + 2 days = 1.5 socks. I was quite impressed with myself and my work ethic. Generally it takes me slightly longer than 2 days to finish one sock (my average is 4 days), and the second sock takes about 8 days. My buzz was somewhat crushed, however, when I discovered that 4 or 5 people had already finished an entire pair of socks on Monday (when last I checked). I know it isn’t a competition, but it does make me feel a little like a loser. 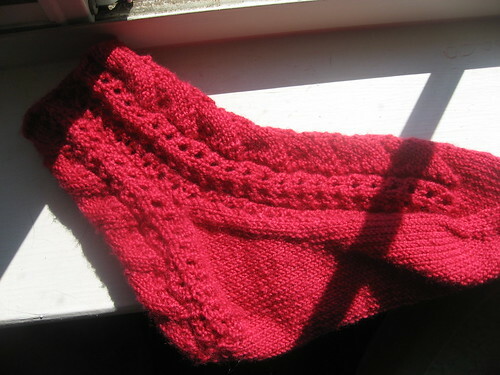 Still, I have high hopes, and I’m planning on trying out the 2 socks on one circular needle for my next pair. And, man do I love Koigu! It is awesome, and has awesome colors, and awesome stitch definition. Maybe if I succeed in knitting up my entire sock yarn stash (which is very possible), I’ll reward myself with some Koigu. Don’t feel bad. I just found time to cast on this evening. I’ll be the slowest.